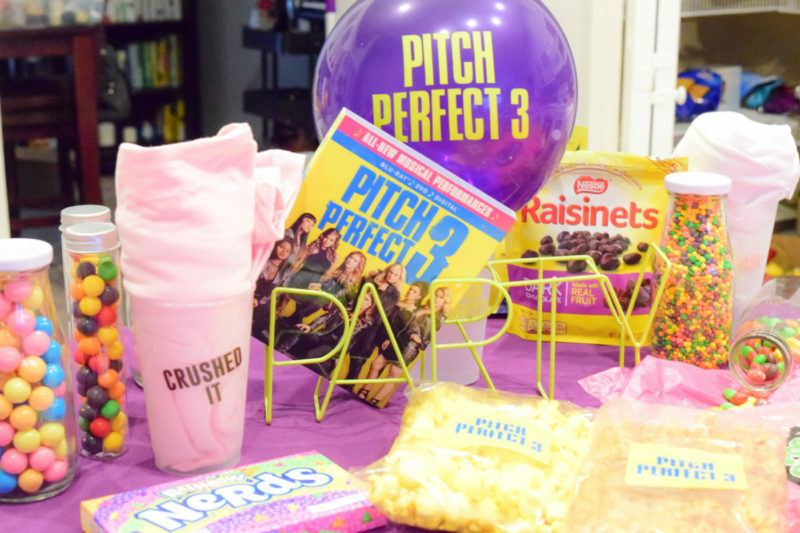 I’ve teamed up with Universal Pictures Home Entertainment to throw a Pitch Perfect party in celebration of the Pitch Perfect 3 Blu-ray release. 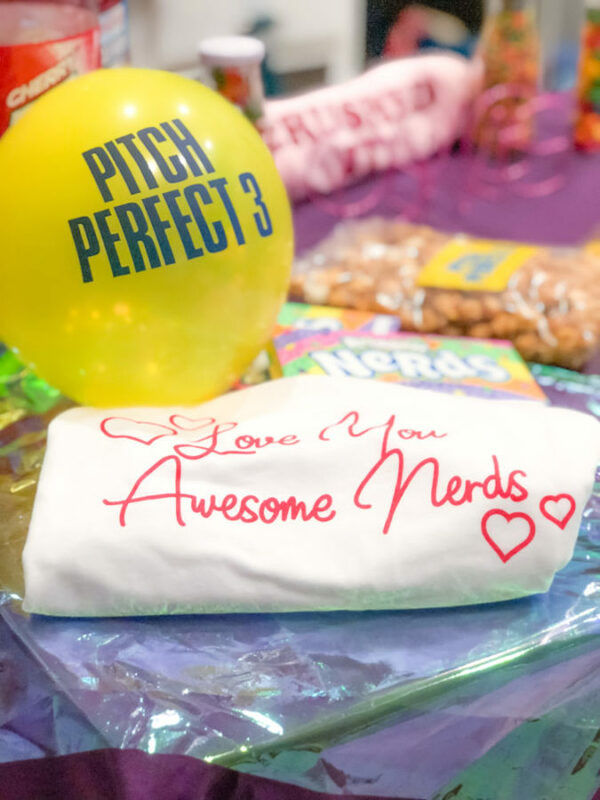 Check out all my ideas for an easy in-home party with an original recipe: ILY Awesome Nerds Party Punch Pops. The Bellas are back for one last call in Pitch Perfect 3! The Pitch Perfect series holds a special place in my heart because my husband and I saw it in theaters as one of our first date nights. Not only does it make me a little nostalgic, it makes me laugh until I cry. Besides, Fat Amy is totally my spirit animal. From that day forward, It became our tradition to see the Pitch Perfect movies in theaters and to add them to our Blu-ray collection. Because of my new baby, the tradition was broken just a little bit. When you’re super pregnant or you have a newborn, going to the theater isn’t really an option. 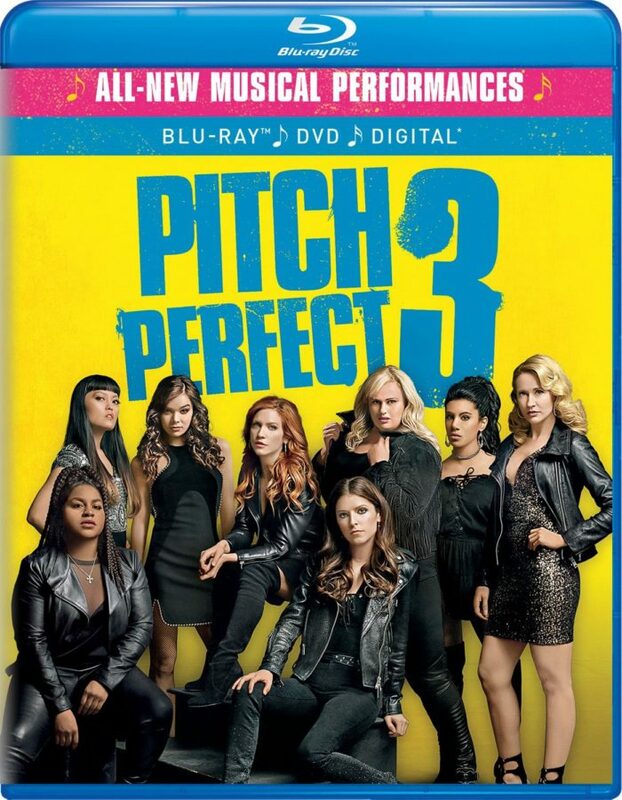 Suffice to say, we had to skip the theatrical release of Pitch Perfect 3 and wait for the Blu-ray release – which was March 20, 2018. I just knew that I needed to make it up to my husband. 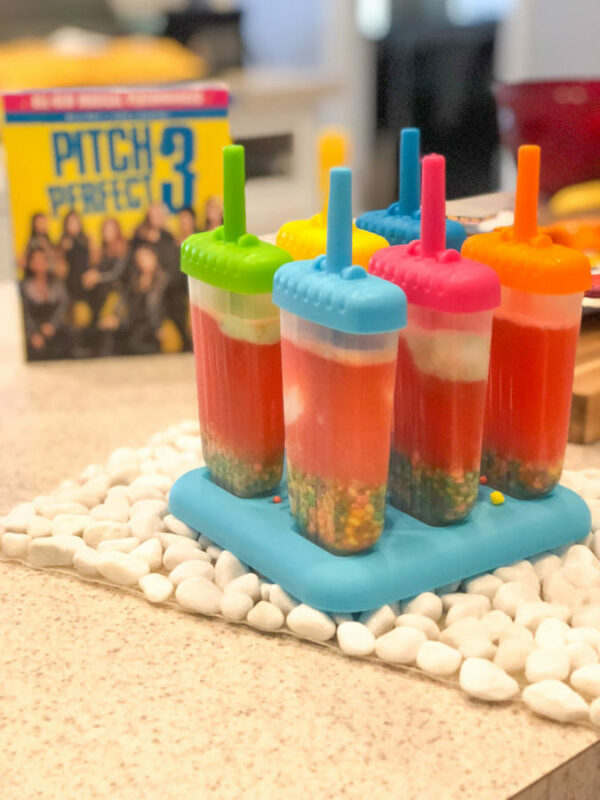 So, I improvised by throwing a Pitch Perfect party at home with Pitch Perfect 3 on Blu-ray! It turns out that this the perfect way to say goodbye to the Bellas! Now available on Blu-ray and DVD, own it with new musical performances, gag reel and extended scenes not seen in theaters. I used some of the supplies that Universal Pictures sent to me for this collaboration and I set up a fun Pitches Night In party for the hubby and I, in between newborn naps of course. 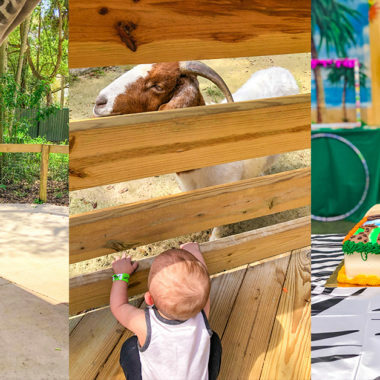 After an intense couple of weeks with our baby boy, I knew that we needed some quality time. 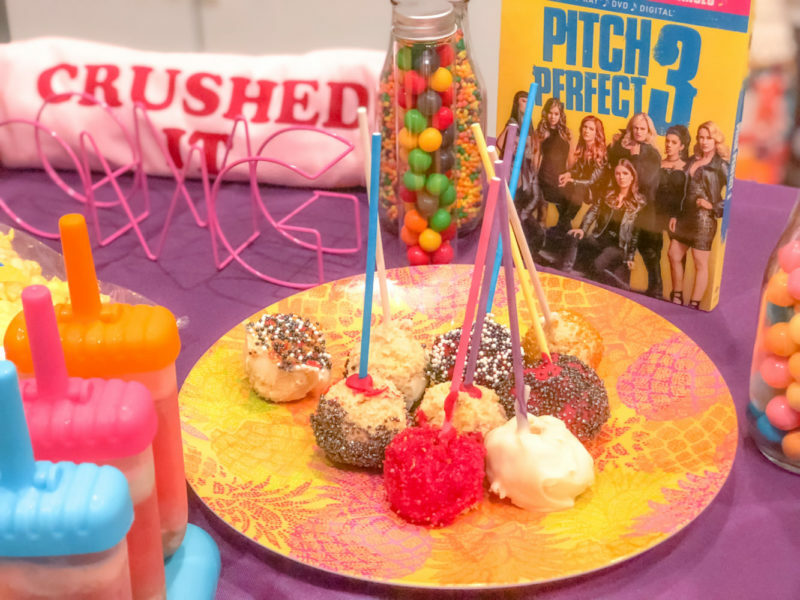 So, I brainstormed a few Pitch Perfect party ideas and I thought I’d share with you just in case you’d like to throw a Pitches Night In with your spouse or girlfriends! Don’t be aca-awkward and forget the Pitch Perfect 3 Blu-ray! 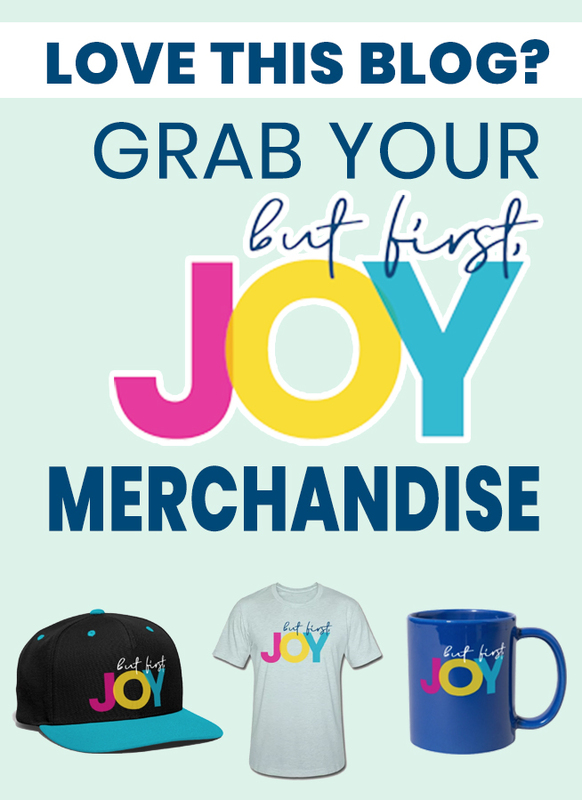 In fact, pick up the whole collection and have an entire binge-watching session! 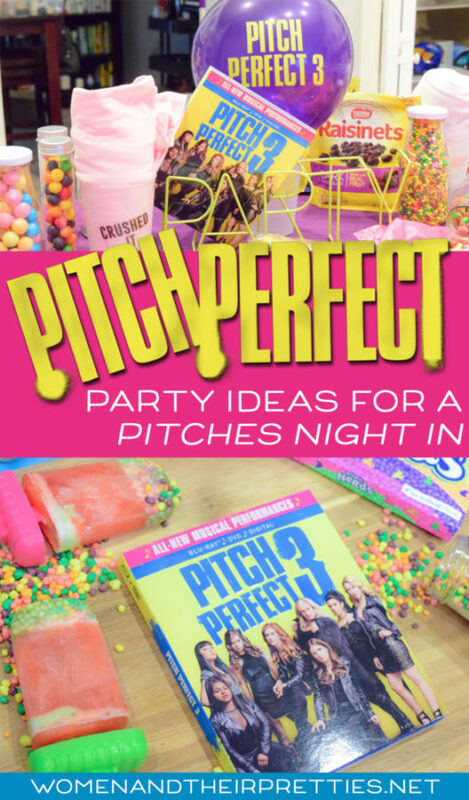 You can get it in-stores or on Amazon to throw your Pitches Night In party this weekend! You can’t have a party without decor. If my husband came home and all I had was a movie, it would be just like any other night. A party is a party because of the decorations! I basically transformed our kitchen island into a colorful & bright party full of everything that will make any Pitch Perfect lover smile. I found a purple table cloth, a couple fun signs, and used some of the promotional decor. You can throw your party with basically anything fun and colorful. Channel your inner Bella and get creative! 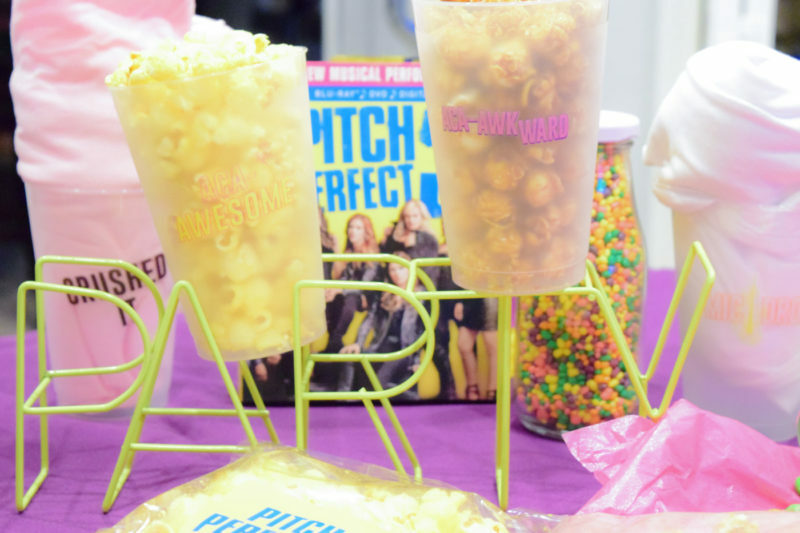 Would the Bellas party without snacks and treats? Absolutely not! After all, Fat Amy’s new motto is “Make America Eat Again”. I’m with you, Fat Amy. I made cake pops which were meant to look like microphones, but didn’t turn out so pretty. I am not a baker, my friends! I went to the dollar store and stocked up on the most yummy and colorful candy that I could find. We have lots of Nerds, Skittles, Gummy Bears, Gobstoppers, gum balls, and more! Oh, and you can’t have a movie without popcorn. Get a big bowl to share or fill up some cups with popcorn. Maybe a popcorn bar with different flavors? 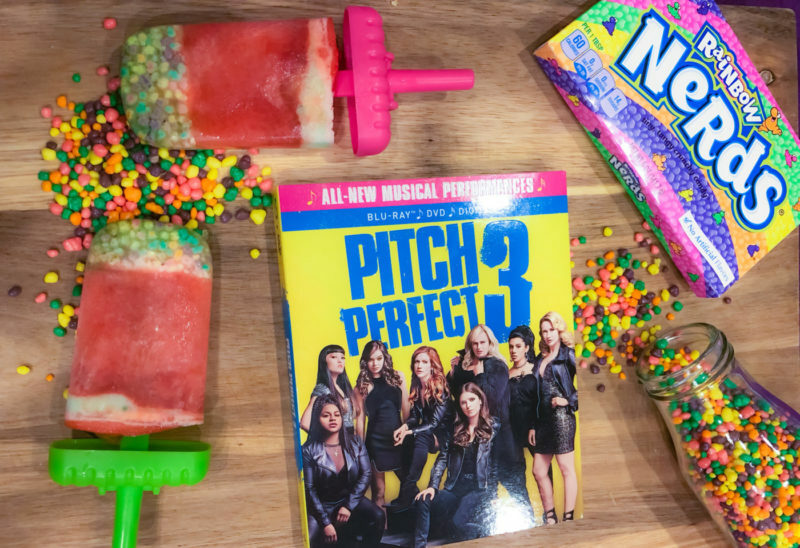 Why not enjoy something a little sweet and a little sour for a Pitch Perfect party? After all, the Bellas can be a little bit of both at times. 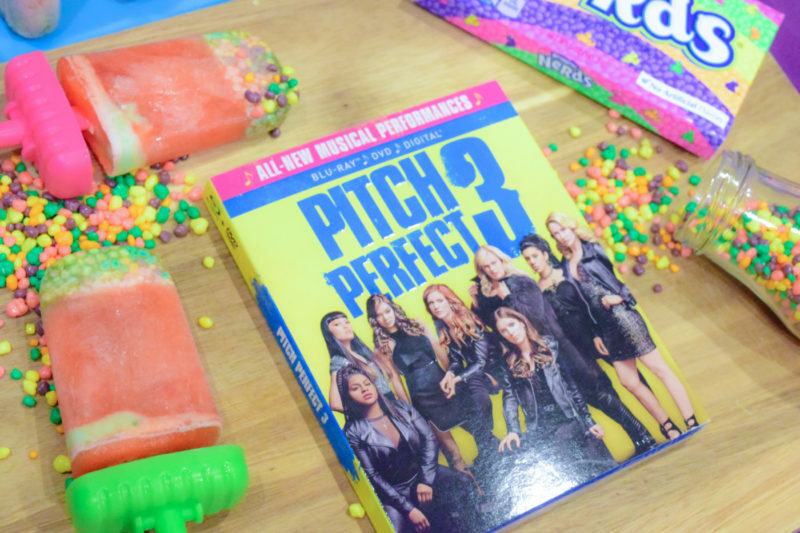 I kept thinking of all the family parties I’ve thrown and something everyone loves is the Party Punch, so I decided to make those into popsicles with an awesomely nerdy twist! These were super easy to make and they were quite the treat for my husband and I. I promise that the kids will love them too! Fill the bottom of your popsicle molds with Nerds candy – as much as you’d like. 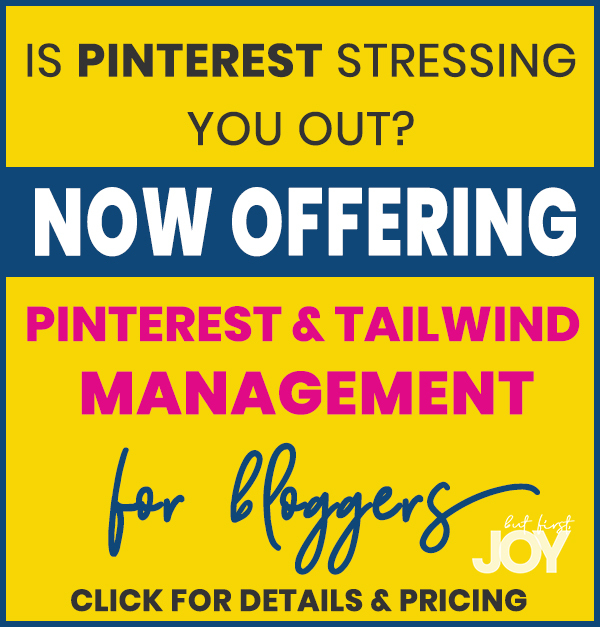 I used about 1-2 tbsp. Drop 1 tbsp of Sherbet into each mold. Fill 2/3 with Fruit Punch, but be sure to leave a little room at the top just in case it expands. Slowly remove ILY Awesome Nerds Party Punch Pops from molds to be sure the pops are frozen onto the sticks. Enjoy them as they are or roll them into more Nerds candy! 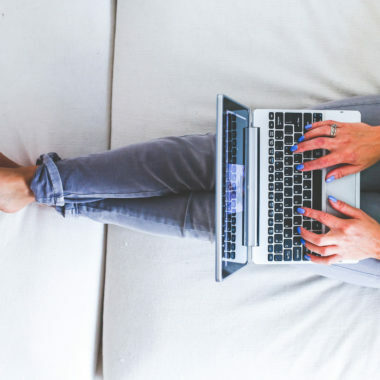 Enjoy your Pitches Night In, Bellas! I think it’s safe to say that I CRUSHED IT! I don’t ever throw parties, so my husband was quite impressed. I don’t think it’s my calling, but I do think I really enjoyed it! Plus, the movie was absolutely hilarious which comes at no surprise. Be sure you watch the Blu-ray bonus features, too! 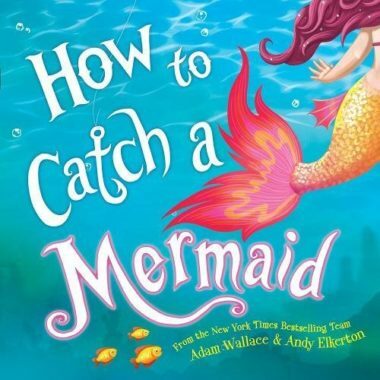 I promise you will not be disappointed!